Hi lovely people, hope you are all well and have had a fab weekend, I've managed to score Thursday and Friday off work this week so I'm super happy!! So onto the irons themselves...they may be micro in size but they are mighty in straightening power. I love them. The packaging is so chic, simple but enough. They come in a hard box, and presentation wise they are beautiful. The irons are sleek in design, and come with so many handy gadgets, it's clear they have been cleverly designed. There's the hibernation setting, meaning there is no more "oh crap did I leave my straightners on" panic (which I am always doing!!) and the cover to cool casing (no more holes in the carpet/duvet cover!) which is included. It even comes with a handy little travel bag. The flex is pretty long, which is great and the voltage setting means it will work in any country - there is nothing they've left out! I am now saving for the larger styler, if something this small can be so good, I have incredibly high hopes for the main styler in the range. 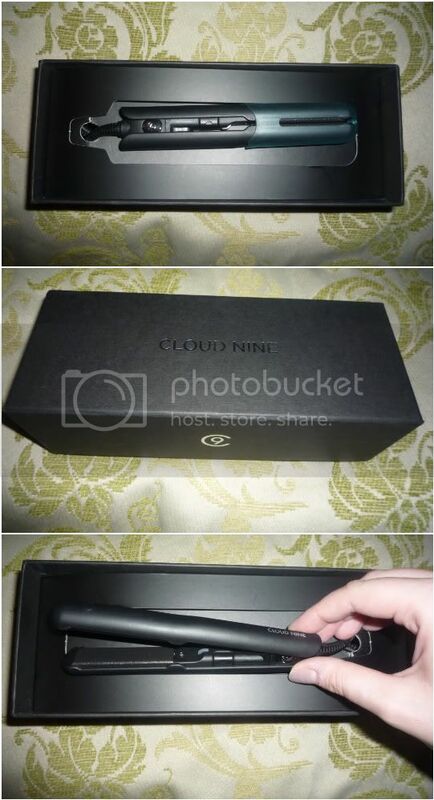 Do you own any of the Cloud Nine brand? Or are you faithful to your GHD's? Maybe you shun the heated beasts and go au natural? Congratulations on the win, Kel! They look gorgeous, the packaging alone is fabulous. They're soooooo teeny...they'd be great for when you go on holiday! My straighteners are huge. Congratulations on the win! I love the sound of hibernation mode, I have lost count of the amount of times I have actually had to drive home to check if I have left my straigheners on!